I'm back! And today I am going to feature our graduation picture. 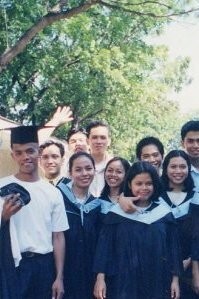 Yes, that was me with my classmates almost ten years ago... I miss them so much. I don't have even an idea that this photo existed. Good thing Giljun (wearing white at the back) uploaded this on his facebook photos. I wonder where are these guys right now. We had our last reunion way back three or four years ago. Hi I'm from Alicia's photo flashback. Cool pic with such favorite memories. A grat place to start finding your buddies is facebook just to say hello. I love it when I see pictures that I've never seen before!! What a treasure, and thank God for Facebook! Hopefully you'll be able to connect with them soon!